Glenda was born on Thursday Island in the Torres Strait in far North Queensland; she is a descendant of the Dhoeybaw and Sui Baidham clan from Saibai Island. Glenda graduated from NAISDA Dance College in 1991 completing her three year diploma in dance, during this time she performed and toured nationally in the NAISA productions “Kayan Walu”, “Djumba Woman” and “Reflections”. Glenda has since worked in Australia’s leading indigenous dance troupes including Bangarra, Descendance, AIDT and Naroo, and has toured in numerous productions nationally and internationally. Aboriginal Deadly Awards Opera House performance. Forming her own group as lead dancer and choreographer for “Urban Zennadth Kes Torres Strait Islander Dance Group”. Descendance/Ngaru in (Sydney/Australia): completing Corporate work, International Conventions, Schools, Community Work, Radio Work, Festivals, Jails, Cruise Liners, Workshops, Galleries, Theatres, Museums, Expos, TV, Political Events, Recording, Humanitarian projects for UNESCO and assignments for The Australian Government. Freelance works throughout Melbourne, Perth and Cairns, performed with Jeffery Waia and Malu Sibui Dance Group from Boigu and Dauan Islands in the Torres Strait. Glenda graduated from UWS Nepean with a BA in Performing Arts. Performed for “Urban Tribal Bricoladge” and the AIDT Cultural Ensemble performing in the production of ‘Drums of Mer”. Bangarra Dance Theatre “Praying Mantis Dreaming”, “Ninni”, “Ochres” toured nationally to WA, the Northern Territory, Cairns, NSW and internationally in Los Angeles, New York and London. 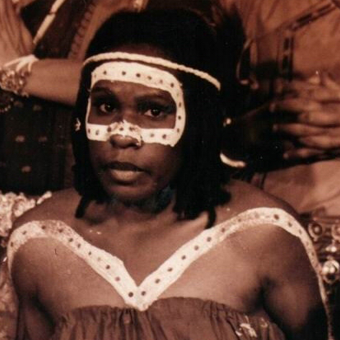 Glenda along with Sean Choolburra formed Sydney’s first independent international indigenous dance group Ngaru Aboriginal and Torres Strait Islander Dance Company.